"This is one of those cornerstone books that will get pulled off the shelf over and over." 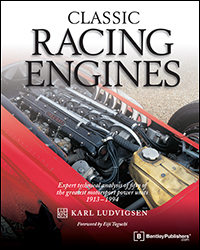 Check out the Speedreaders.info review, or learn more about Classic Racing Engines by Karl Ludvigsen on our bookstore webpage. Before you break out the champagne to toast a new automotive title by this author—something Ludvigsen years ago said wasn’t going to happen anymore because he’s now into aero topics—realize that this is not a new book! 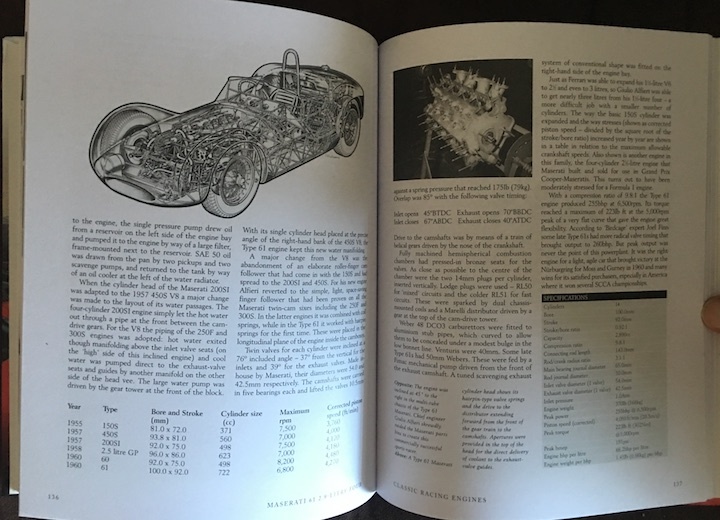 In fact, chances are you have it already, because absolutely no serious motorsports library would have street cred without it. 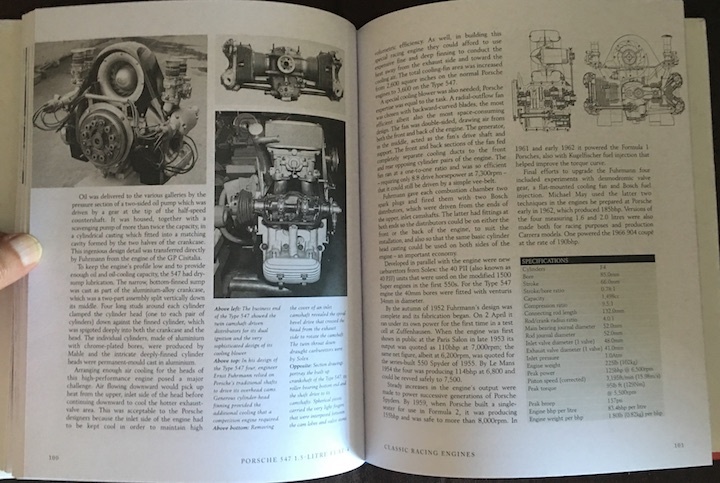 The book covers in chronological order 50 mostly European engines along with some Japanese and US powerplants. (Note that all the specs use the same units of measure so you can compare apples to apples without conversion hassles.) Taking a look at an item at the back of the book, a 2-page Specification Comparison, reveals a supremely important and not really intuitive point: size . . . is not everything! If it were, a book like this that looks at what all goes into making the secret sauce would really not serve a purpose in the first place. A very large number of usually incompatible requirements must be satisfied and it takes someone like Ludvigsen—who is an engineer and a journalist and an all around curious soul—to distill the relevant detail without drowning the reader in jargon and minutia. In many ways, this book really is way too short to plumb the depths of the subject, but then this book is really more of a highlight reel. 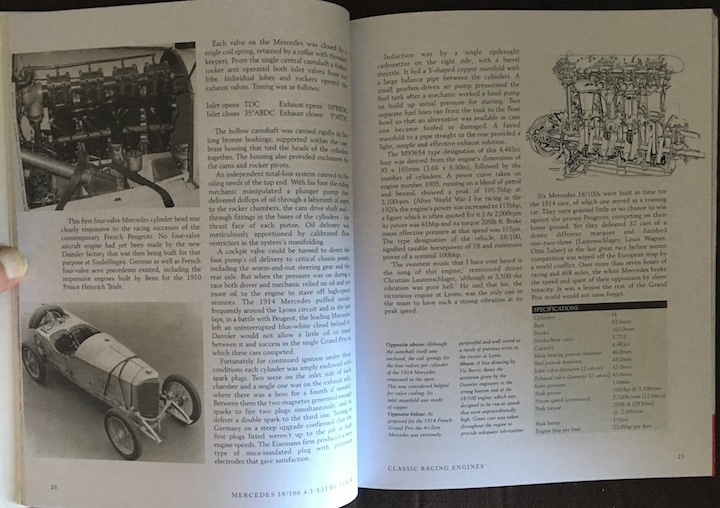 The introduction by engine designer Eiji Taguchi identifies five key areas the designer must address: “An engine can never prevail when only one of them is excellent.” From the 1903 Peugeot to the 1994 Mercedes Benz V8, the book examines 50 different ways of solving the puzzle. If this were a 2017 book and not a straight reprint, modern-day goodies like KERS would have to have been included. Clearly, this book is not for the casual reader. If inlet timing and metallurgy and exhaust gas scavenging leave you cold, you won’t be entertained or inspired. A Glossary is provided but not wholly satisfactory; for instance it includes not only the expected technical terms but also tradenames of makers (cf. Amal, Cozette, Sum) that are included in the Index anyway. All the illustrations are b/w, definitely a holdover from the Haynes days which until the end was irrationally attached to them. Some of the technical drawings and other line art have legends on them but they are, still/again, mostly too small to read. You won’t become an engineer by reading this book, or, if you already are, glean enough information to be able to fully weigh the entire spectrum of the operating parameters but the book is good at laying out higher-level concepts and what goes where and why.